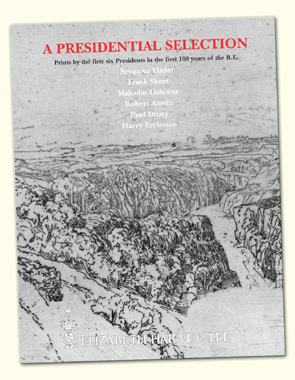 Prints by the first six Presidents in the first 100 years of the R.E. This catalogue is by way of a celebration of the 200th anniversary year of the birth of Sir Francis Seymour Haden (1818-1910), instigator and first President of the Royal Society of Painter Etchers. Sir FRANCIS SEYMOUR HADEN P.R.E. Haden was a remarkable man, achieving success in two totally unrelated fields. 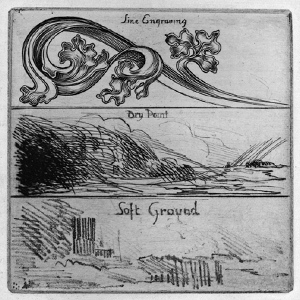 He was professionally a renowned practising physician and surgeon, and in his spare time, in conjunction with fishing trips, a fine etcher; a founding father of the Modern British school of etching, as well as of the Society of Painter-Etchers itself. It was as a medical student in Paris in 1840 that Haden took drawing lessons, to improve his hand and eye co-ordination as a surgeon. And it was in a ‘grand’ tour of Italy, in 1844, that he probably made an initial attempt at etching, which obviously inspired an interest in the past history of the medium. Back in London, when he set up his medical practice, he began collecting and studying old master prints, in particular the etchings of Rembrandt. He not only built up a fine collection by the Dutch master but in the following years created a new catalogue, attempting a chronological re-ordering to understand the artist’s development; a real contribution to print scholarship. All previous catalogues had been arranged by theme. In 1847 Haden married the older half-sister of the thirteen year old Whistler. Haden encouraged Whistler’s interest in art and introduced him to the 17th century Dutch etchers. A decade later, a visit from Whistler, as an art student in Paris who had just made his first etchings, led Haden to experiment with etching again in 1857 and to join the Etching Club. 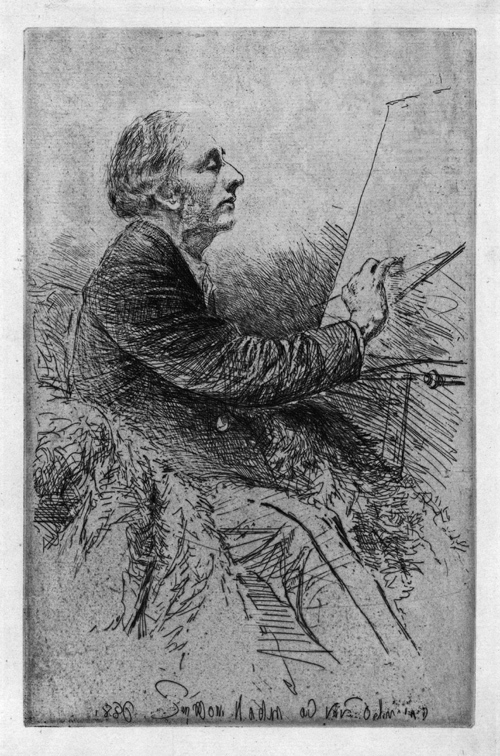 A visit to Paris in 1858, when Whistler took him to Delâtre’s, to watch him proof Whistler’s newly etched plates, inspired Haden both to invite Delâtre to London to demonstrate to the Etching Cub members, and to buy himself an etching press and set up an etching ‘studio’ at the family home in Sloane Street, from where he also ran his medical practice. In these early years, until they fell out, Haden and Whistler often etched together. In 1860 they both successfully submitted etchings to the R.A. Summer show, Haden using an anagram of his name, H Dean, to remain anonymous. Both also exhibited at the Paris Salon. Haden was invited to join the newly established, and fairly short-lived, Société des Aquafortistes in Paris in 1862. The French art critic and writer Philippe Burty saw and admired his work and made a catalogue listing of Haden’s etchings, published in the Gazette des Beaux Arts in 1864. He also instigated the idea of Haden’s ‘book’ Etudes à l’Eau-forte, which had text by Burty, including his descriptive catalogue, to accompany impressions of thirty of Haden’s etchings, which was published in Paris and London in 1866. Though intended to be an edition of 250, only 180 sets of etchings were printed. This catalogue offers a number of impressions issued in the Etudes à l’Eau-forte. This was the beginning of Haden’s reputation as an etcher, both in France and England. The first major show of his etchings in England took place at the Fine Art Society in London in 1878. That year Haden resigned from the Old Etching Club and two years later, from a meeting in his home with five other artists interested in etching, the Society of Painter-Etchers was founded, of which Haden was elected the first President. He remained President until his death, serving for thirty years. At this period as regards membership of printmakers, the Royal Academy acknowledged professional engravers, exhibiting prints usually reproducing the paintings of Royal Academicians, as Engraver Academicians – though limited to only two members at any given time. Haden battled to change this outlook. He championed printmaking as an original creative art in its own right. The Society of Painter-Etchers offered an alternative and specialised exhibiting opportunity for artists who made original etchings; from 1881 holding an annual exhibition of members’ works. In 1882 to further promote original printmaking Haden made an extensive lecture tour in America, where his prints would be much collected. After retiring from medicine in 1887, Haden moved to Hampshire and was able to devote more time to promoting creative printmaking and the Society, which Queen Victoria granted Royal status in 1898. She had already knighted him in 1895, the year he finally published his book The Etched Work of Rembrandt, True and False. He also arranged two influential exhibitions of Rembrandt etchings, from his own collection, in 1867 and 1879. Rembrandt inspired much of Haden’s own immediacy of style, his sometimes dramatic reworking of subjects in successive states, and his use of drypoint. Though an etcher only in leisure moments, often on holiday and fishing trips, Haden produced an impressive body of work, as can be seen from the prints offered in this selection. Landscape predominates, and perhaps because he was not a formally trained artist his figure subjects can be less successful except where he sort help or inspiration from photographs. But he was very good at animals, which he often included at varying stages in different states of his plates. 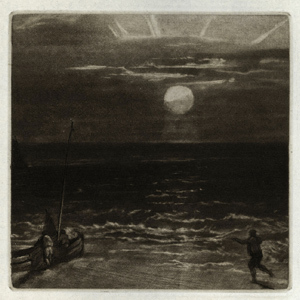 In later years, perhaps under the influence of Turner, or because his eyes began to fail, Haden started to use mezzotint, reworking over some of his earlier originally etched plates. His interest in mezzotint predates that of Short. Haden was a true amateur, in its original sense of a ‘lover’ of the activity. Self-Portrait at the Easel. Etching 1881, after an anonymous photograph. 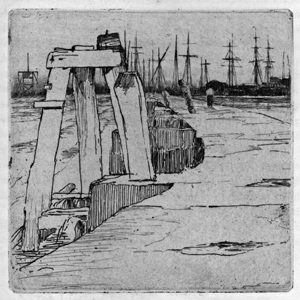 Sir FRANK JOB SHORT P.R.E., R.A.
Short made his first etching, printed on the family mangle, while he was training to be a civil engineer. When he qualified in 1883 he abandoned engineering for full time art studies and aged twenty-six enrolled at the South Kensington National Art Training School (which would be renamed as the Royal College of Art). 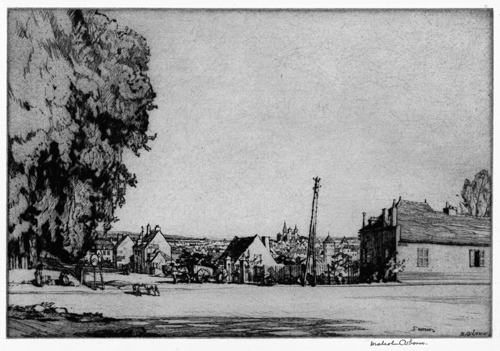 At this period Frederick Goulding was in charge of the etching class. Short also attended life drawing classes at Westminster School of Art, though figures would never have a prominent place in his work; and studied watercolour at the Royal Institute of Painters in Watercolours. 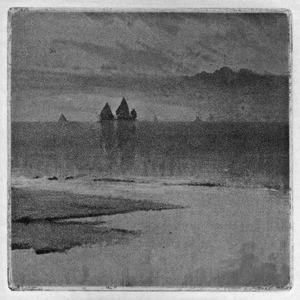 Short’s interest in the tonal techniques of aquatint and mezzotint began in 1884. Until then, in 19th century England, aquatint was associated with the decorative hand-coloured topographical and sporting prints of the 1820’s (superseded in the 1840’s by lithography) and mezzotint was almost totally identified with reproductive engraving. 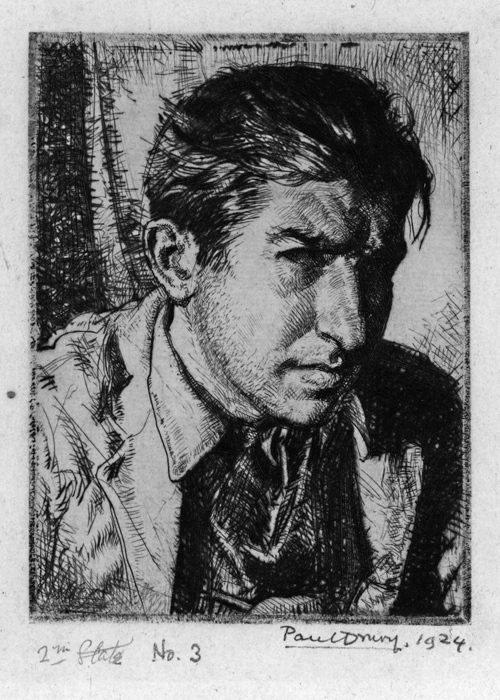 Short rediscovered both as media for original creative printmaking and it was in mezzotint and aquatint that he made most of his acknowledged masterpieces. His Diploma print on election in 1885 as a Fellow of the Society of Painter-Etchers (it was granted its Royal status only in 1888) was the original mezzotint The Tide Ebbs, Putney Bridge. 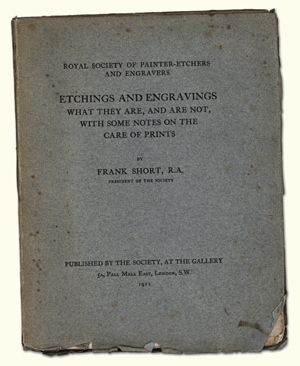 It was largely at Short’s instigation that the Society’s name was enlarged in 1898 to the Royal Society of Painter-Etchers and Engravers. However, perhaps because it was quicker and more spontaneous, linear etching predominated in his work and leant itself to the play of horizontals and verticals in river scenes and coastal mud flats punctuated with occasional vertical posts, among his recurring subjects. An influential teacher, beginning as assistant to Goulding at the R.C.A., he took over the class in 1891 and on the Class’s upgrading in 1920 to the School of Engraving, was appointed the first Professor. Short won the recognition as a printmaker, and the related honours, that Haden had been fighting to achieve. Elected an Associate of the Royal Academy in 1906, and an Academician in 1911, the same year he was knighted. From 1919 to 1932 he served as Treasurer of the Royal Academy. He served on the R.E. Council for fifty-six years and as President for twenty-eight. During Short’s presidency, 1910 – 1938, wood engravers were admitted to membership; the Print Collectors’ Club was established and the motto, still current, which originated with Whistler, NULLA DIES SINE LINEA (No day without a line) was adopted. 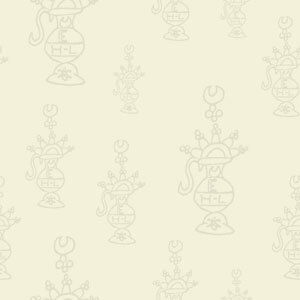 Short’s ETCHINGS AND ENGRAVINGS/WHAT THEY ARE, AND ARE NOT, WITH SOME NOTES ON THE CARE OF PRINTS. Forty-page paper bound booklet published by the R.E. 1911, illustrated with four original prints by Short giving examples of the various intaglio techniques, hard-ground and soft ground etching, drypoint, aquatint and mezzotint, together with one ‘blind’ printed plate. MALCOLM OSBORNE C.B.E., R.A., P.R.E. A student at Bristol School of Art prior to attending the R.C.A 1900-1906, it was only at the Royal College, having begun in the sculpture department, and then tried architecture, that in 1901, in Frank Short’s engraving classes, Osborne found his metier as an etcher. 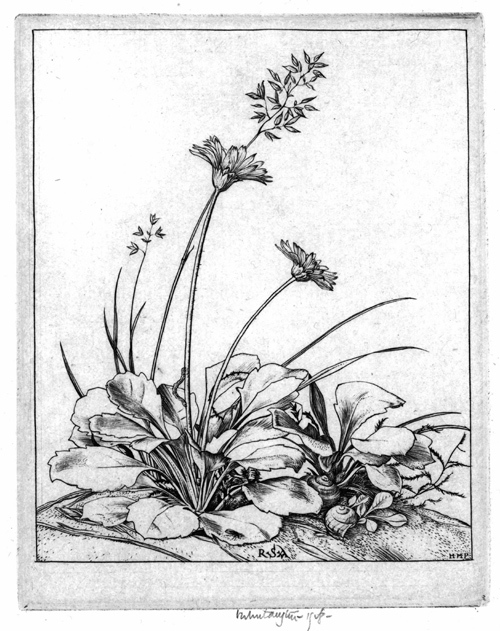 His first etching was published in 1904, while he was still a student. In 1905 he was elected an Associate of the R.E. and only four years later a Fellow. Like the prints of many of his generation who worked in the Etching Boom years, Osborne’s sympathetic landscapes, urban scenes and portraits are sometimes underrated today. Yet his reputation was such that, while abroad in World War One, when he served in the Artists’ Rifles and 6oth Division in France, Salonika and Palestine, he was elected in June 1918 an Associate Engraver of the Royal Academy and in 1926, a Fellow. Osborne succeeded Frank Short as Professor at the Royal College, on Short’s retirement in 1924, and like Short, he too was an influential and respected teacher for many years. He was awarded the C.B.E. in 1948. Osborne also followed Short as President of the R.E. Short stood down in 1938 at the age of eighty, having served for twenty-eight years. Osborne was President until 1962, the year preceding his death at the age of eighty-three. 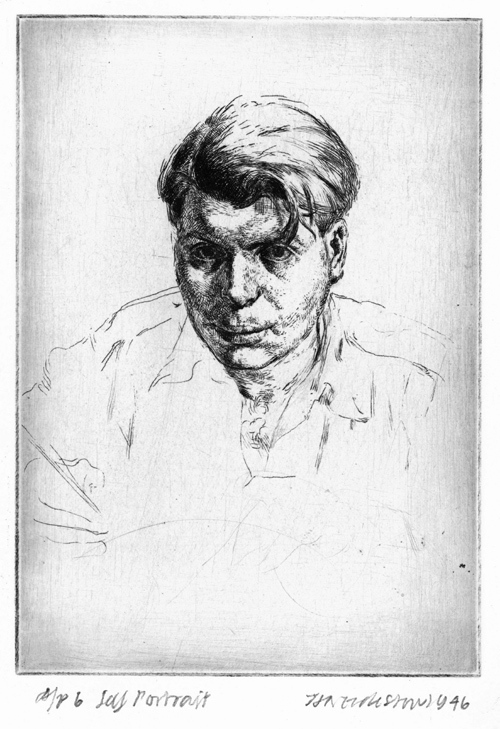 During Osborne’s presidency some book ‘illustrators’ and more modernist printmakers were invited to join, including Anthony Gross, John Copley, Gertrude Hermes, John Buckland Wright; and Muirhead Bone (admiration of whose drypoints is apparent in Osborne’s work in the medium) was made an Honorary Fellow. An important exchange exhibition took place with the Society of American Graphic Artists, so that for the first time the work of the leading American printmakers was shown in London. The category of Senior Fellow was created to free up an allowance to enable an increase in younger members. Sir MALCOLM OSBORNE C.B.E., R.A., P.R.E. issued as a Print Collectors’ Club presentation print for 1937. ROBERT SARGENT AUSTIN P.R.E., R.A., P.R.W.S. Austin began his studies at Leicester School of Art, moving to the R.C.A. in 1913. His studies there, with Frank Short, were interrupted by War service as a gunner in the trenches. He returned to the R.C.A. in 1919. His association with the XXI Gallery as his publisher began the following year, and in 1921 he was elected an Associate of the R.E., all still while a student at the Royal College. As a winner of the Prix de Rome he spent 1922-1925 in Rome, where he established his mature style and began to use engraving, increasingly his preferred medium after 1925. Italy, in its landscape urban and rural, and its people, provided Austin with many subjects, even in later years. On his return from Italy he joined the staff of the R.C.A. in 1926, replacing Job Nixon as Malcolm Osborne’s assistant. In 1948, on Osborne’s retirement, he took over as Professor of Engraving at the Royal College and in 1962 succeeded Osborne as President of the R.E., continuing the tradition of somewhat elderly, and previously very long serving, presidents. ALFRED PAUL DALOU DRURY P.R.E. Son of the sculptor Alfred Drury, it was perhaps the result of losing an eye in a shooting accident at the age of eleven, that Paul Drury followed a career in two-dimensional graphic art. He enrolled at Westminster School of Art in 1918 and from 1921 attended Goldsmiths, where successively first Frederick Marriott, then Malcolm Osborne and finally Stanley Anderson were his tutors. Later he returned to Goldsmiths to teach, becoming Principal. At Goldsmiths College Drury was a fellow student of Graham Sutherland, William Larkins, Bouverie Hoyton and Robin Tanner and shared their discovery and delight in the romantic pastoralist etchings of Samuel Palmer. With Sutherland he was invited to visit Frederick Griggs, another Palmer enthusiast, in Chipping Campden in 1926, taking plates to be printed on the Dover’s House press. However, Drury’s main concern always was portraiture; he made only a few intensely and beautifully needled pastoralist landscapes. Drury was elected an Associate of the R.E. in 1926 and a Fellow in 1932. He served as President from 1970 to 1975; the first for sixty-five years not to be associated with the Royal College of Art. In his history of the Society Martin Hopkinson describes Drury as a reforming president. Until his Presidency the Society remained much in the late Victorian gentleman’s club mould established by Haden. Drury wished to make closer contact with the members and sent out a regular ‘letter from the President’, amusingly nicknamed by Harry Ecclestone the Epistle of Paul. Drury tried to extend the breadth of interests of the Society and suggested they absorb the Senefelder Club and welcome in lithographers, but was over-ruled. It was under his watch that the Print Collectors’ Club decided to return to their original tradition of specially commissioning prints from members for the annual presentation plates, rather than, as had developed over time, selecting the prints from the Annual Exhibitions. .
HARRY NORMAN ECCLESTONE O.B.E., P.R.E., R.W.S. Eccleston grew up in the Black Country on a small housing estate opposite Caponfield steelworks, and industrial ‘landscape’ would inspire him throughout his career. He was only eleven when he started taking part-time classes at Bilston School of Art and fourteen when he became a fulltime student, also attending Birmingham School of Art. With a hiatus during the War in which he served as an anti-submarine officer in the Royal Navy, it was 1947 when Eccleston began his studies in the Engraving School of the Royal College of Art, under Robert Austin. A decade later Austin recommended Eccleston as the first in-house Artist-Designer to the Bank of England; a post he held until 1983, designing the Bank’s ‘D’ series of banknotes issued in 1970, the first fully pictorial notes, with images of Isaac Newton, the Duke of Wellington, Florence Nightingale, Shakespeare and Christopher Wren on the reverse of the Queen’s portrait. Eccleston was elected an Associate of the R.E. in 1948, while still a student at the R.C.A. and a Fellow in 1961. From 1975 to 1989 he served as President, overseeing the Society’s move from Conduit Street to the Bankside Gallery. He also urged the acceptance of a wider range of printmaking media and began process to modify the Society’s name to its present title, Royal Society of Paint-Printmakers, ultimately granted in 1991. Prints from this catalogue are still available.